You Don't have time, We have solution for you. Plant a Tree Download App. Plant a Tree, For Your child & loved one's. By Planting a tree by each person, we can save the earth and play against of pollution. Plants are the only solution to clean the air. As per the current time demands we must go for it. Clean air keeps you healthy and you can enjoy your life with your healthy body. Sign Up & Register your land with us for the plantation and help in the mission of Green Bharat. Our Expert will visit your land and Verify your land documents and test your soil to suggest the plants. Green Bharat, Allocate plants suitable for your land and notify you for the plantation. Get each month renew, Take care of plant and plant will be yours for the lifetime. Green Bharat, Allocate plants to any land and notify you for the successful allocation. 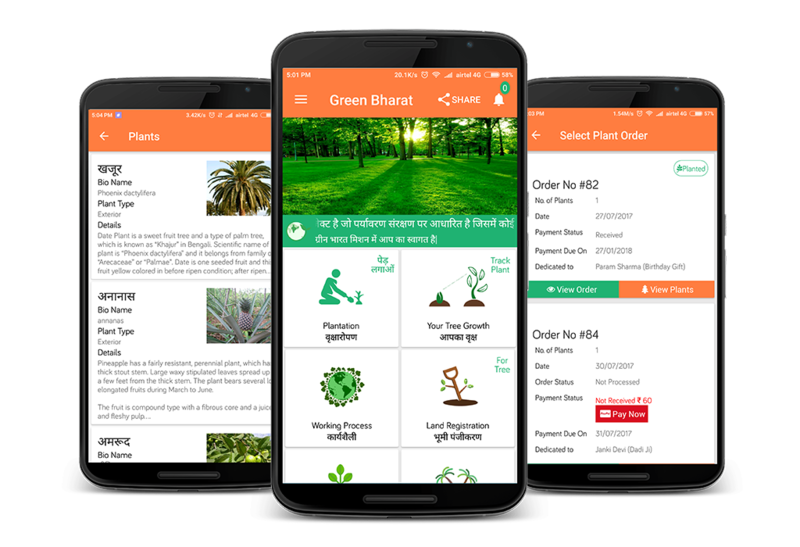 Track Your Order from your Green Bharat App or Website at your home. Plantation gives you a hidden immense feeling of happiness. Register and Plant a Tree. Green Bharat, Allocate plants to land. Track Your plant at your home. Manage Orders & Lands from the Mobile App. Download the Mobile App and Manage Quickly. © 2019, Green Bharat Unit of NTPL(Netparam Technology Pvt Ltd).